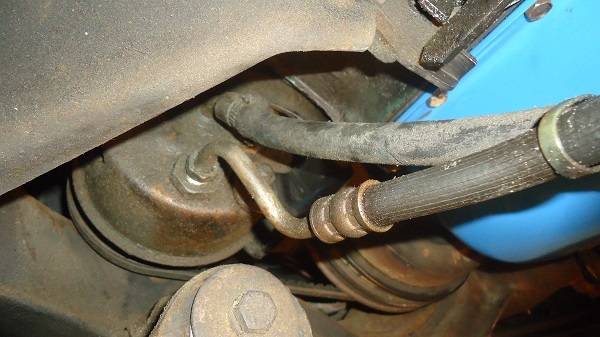 Simply from age, power steering hoses will harden, crack and leak, and will need to be replaced. 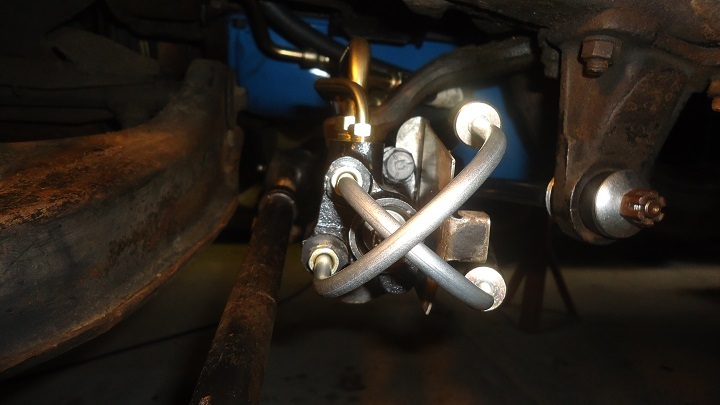 After rebuilding the control valve and steering cylinder on my 1982 Corvette, I replaced the four PS hoses. Procedures for 1963-1982 Corvettes are virtually the same. The low pressure hose is the same from 1963 through 1982. 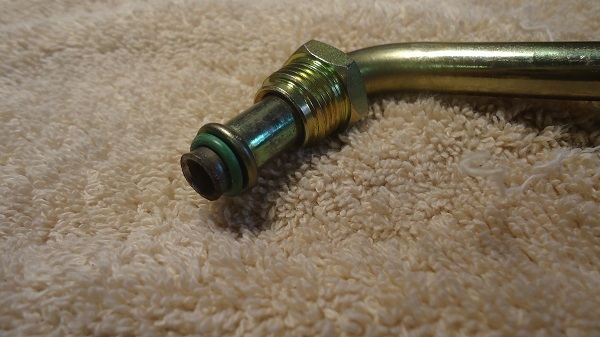 The high pressure hose is the same from 1963 to 1979, and 1980-1982 pressure hoses are the same. The low pressure side uses a hose clamp on the steering pump and a pressure fitting on the cylinder. The high pressure side has a pressure fitting on both ends. In 1980, the discharge fitting on the PS pump was changed to metric thread, to 16x1.5mm (18mm wrench size) and uses an o-ring seal. The two hoses that run from the control valve to the steering cylinder (extend and retract hoses) are all the same from 1963 to 1982. 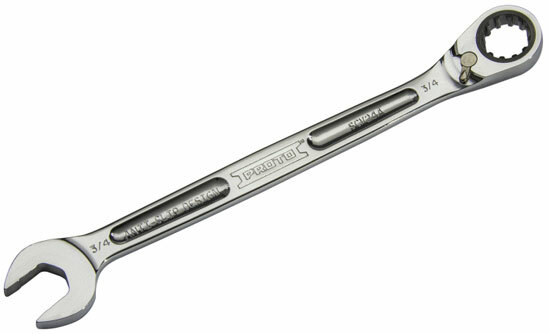 Flare-nut wrenches, also called crows-feet wrenches, are preferred over open-end wrenches, although an open end wrench will come in handy to speed up the process in between loosening and tightening. Get the car up on four jack stands and remove the driver's side front tire. I removed my front right tire as well, since I was doing other maintenance after I completed replacing the power steering hoses. Replacing the power steering hoses is a messy job. 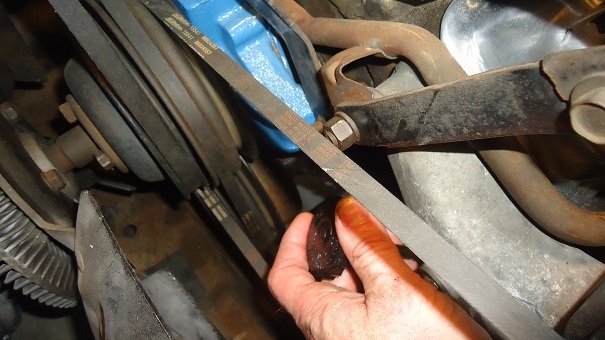 Place a catch pan under the power steering pump. I kept the car cover on my car (and some old towels), in case I got any fluid on the paint. Unless you like busted knuckles, wear work gloves to protect your hands while you are breaking free the fittings. It's a good idea to wear safety glasses, too. Disconnect the two PS hoses from the control valve, letting the fluid drain out into a container. Remove the hoses. When removing the pressure hose from my steering pump, I used a 1" wrench on the large nut, then a 5/8" flare-nut wrench on the fitting. 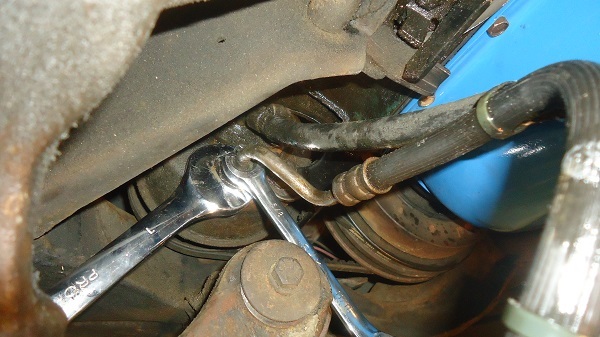 I used flare-nut wrenches to break the fittings free and then later to snug them back down. If your pump still has the original factory clamp on it, you can remove it by clamping down on the crimp edge with a sharp pair side cutters and cutting it. If there's a hose clamp there already it will be easier. 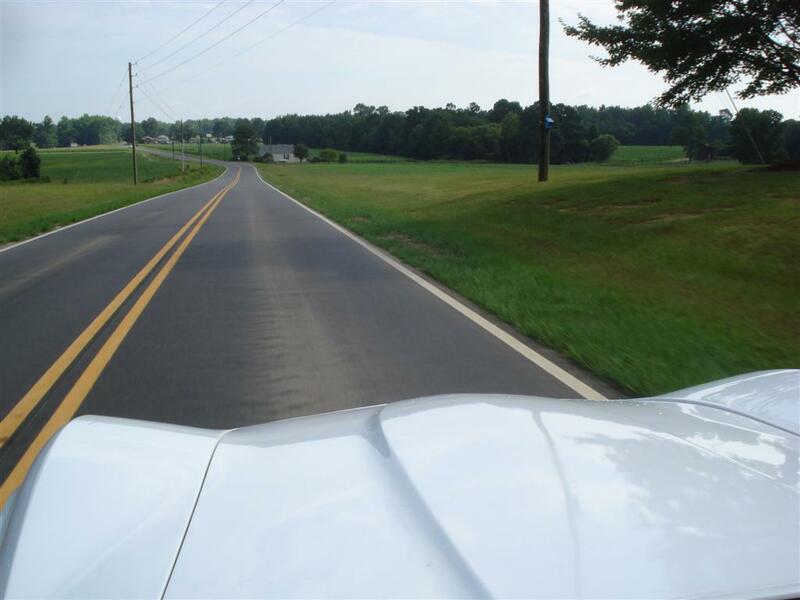 After you have the hoses disconnected, do not move the wheels or power steering fluid will shoot out of the ports! Dispose of the old fluid properly. It gets recycled with used engine oil. To install the new hoses, start with PS pump side first. If your Corvette is a 1980-1982, be sure to install the small o-ring. There is also large o-ring that sits behind the big nut in back of the PS pump. If you want to change this, be aware that it's spring-loaded. Oil o-rings with p/s fluid and carefully thread in the couplers. Install the pressure hose onto the control valve next, then return hose can be installed. Start fittings by hand to ensure they're going in correctly. Don't over-tighten the fittings or you could twist a pipe or a fitting. Also be careful with the connections to the control valve, because the casting can crack. 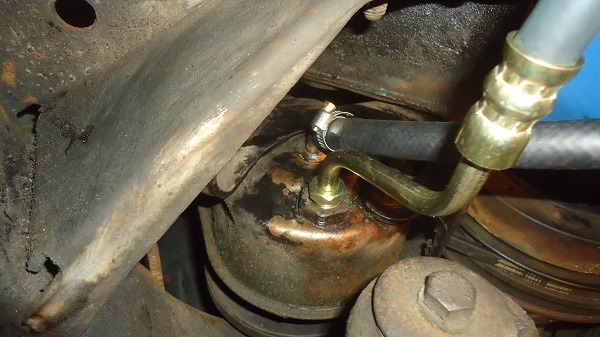 The extend and retract hoses to the steering cylinder can be tricky to install, since they are slightly angled. Do not use a wrench to tighten these until you start them by hand. After the new hoses are installed, wipe down any drips and look for leaks. Remove the drain pan and put some old cardboard under the car. Fill the PS pump with quality power steering fluid. Getting to the pump was awkward on my '82, its sort of "hidden" under the alternator. I used a long flexible hose with a funnel. Check pump fluid level and add as required, but it shouldn't need very much. It is not necessary to completely eliminate all of the 40 year-old fluid (or who knows what was used to replenish through the years.) But the more genuine fluid you add, the better. Automatic transmission fluid (ATF) is similar, but not identical to power steering fluid. Power steering fluid contains additives designed to help the pump perform optimally as well as to prevent seals from leaking. While some manufacturers recommend ATF for their vehicles, GM specifically recommends PS fluid for the Corvette (see owner's manual). 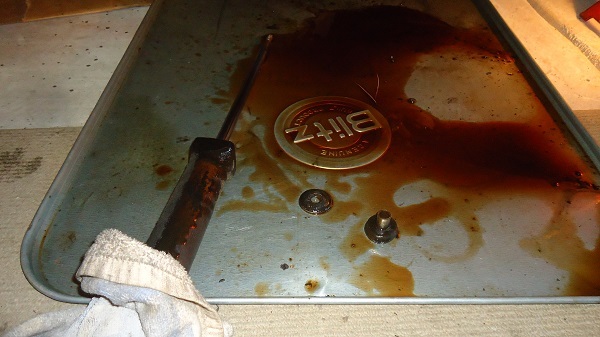 ATF would undoubtedly work, but it might not be the best hydraulic fluid in this case. After the PS pump is full, crank the engine and let it run for just a few seconds, then shut it off. After the engine is running the fluid level drops. Check and top off the fluid level. Repeat until the fluid level no longer drops. If the fluid starts out foamy, don't be alarmed. It will work itself out as air is released from the system. 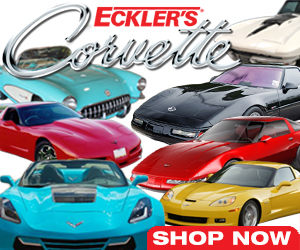 Note - Your Corvette's power steering system is self-bleeding, as the return line constantly brings fluid back into the reservoir. 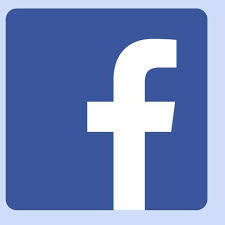 However, if you'd like, you can manually bleed the system. Turn the steering wheel at least three full turns lock-to-lock to purge the air out of the system. If you see air bubbles in the reservoir, let the car sit a couple hours and check the level again. While driving slowly, move the steering wheel all the way to the left, then all the way to the right several times. Double-check for leaks afterwards.